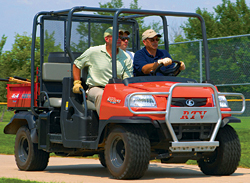 The RTV1140CPX features a transformation system that converts from one- to two-row seating, allowing the operator to choose between additional passenger capacity and more cargo space, depending on the task. The four-wheel-drive unit features a three-cylinder, 24.8-horsepower, diesel engine, four-wheel, wet disc brakes, and hydraulic power steering. Maximum cargo load is 1,100 pounds, and maximum towing capacity is 1,300 pounds.